Exascale: The Faraway Frontier of Computing? Those of you who follow this blog know that I write about technology trends that are, in general, not too far into the future. This post is a departure in that it takes a peek at a technology at least 10 years away dubbed (for the moment) as “Exascale Computing.” I’m writing about it now because the chances of my living long enough to see it come to fruition are somewhere between slim and none, and because I used to be very involved with the supercomputing industry and absence makes the heart grow fonder. Driving the development of this technology is a project known as SKA, which stands for Square Kilometer Array, a multibillion dollar radiotelescope 100X more sensitive than anything currently in existence. Construction will begin in 5 years and will not be completed until 2024. 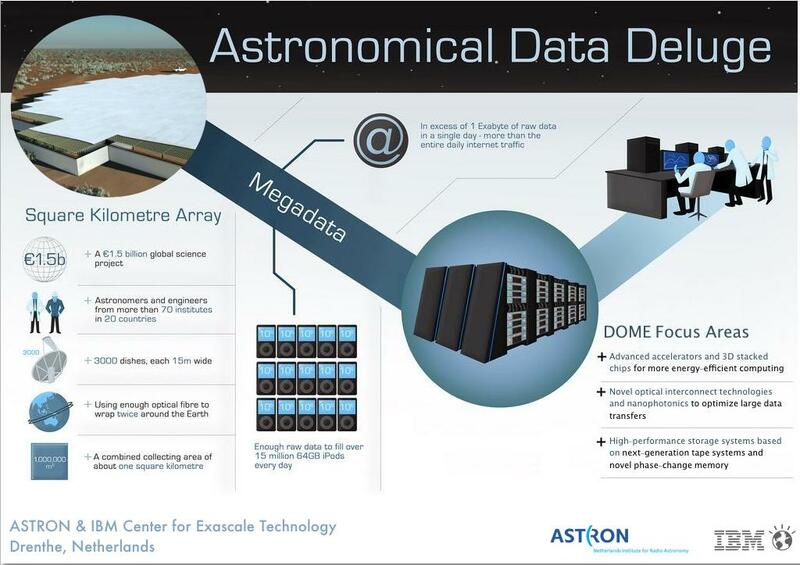 When it is operational, SKA will produce an Exabyte of data every single day. To put that into perspective, that is twice the amount of data on the Internet worldwide – 1 quintillion bytes of information. The SKA project is headed by ASTRON, the Netherlands Institute for Radio Astronomy. To meet the vast computing requirements that will be needed to process that much information, ASTRON awarded IBM a $40+ million contract to begin developing what will be the world’s most powerful computer, equivalent to the combined computing power of 100 million high-end PCs. There are three challenges that IBM will be addressing (see the graphic above): transport (of data between computing elements), data storage and analysis. Transport will be addressed using optical technology that is well-understood today. Analysis will rely on massive parallel processing arrays with the power of a million+ Watsons. Storage will rely on the development of new technology, most probably based on IBM’s research in nanotechnology applied to “phase-change memory.”. If you are interested in this project, I urge you to view a short video about the SKA and IBM’s involvement in the project at this website. Trust me, you will be amazed at the scope of the project and the technology challenges that will have to be overcome.